Eating Soba Buckwheat Noodles. 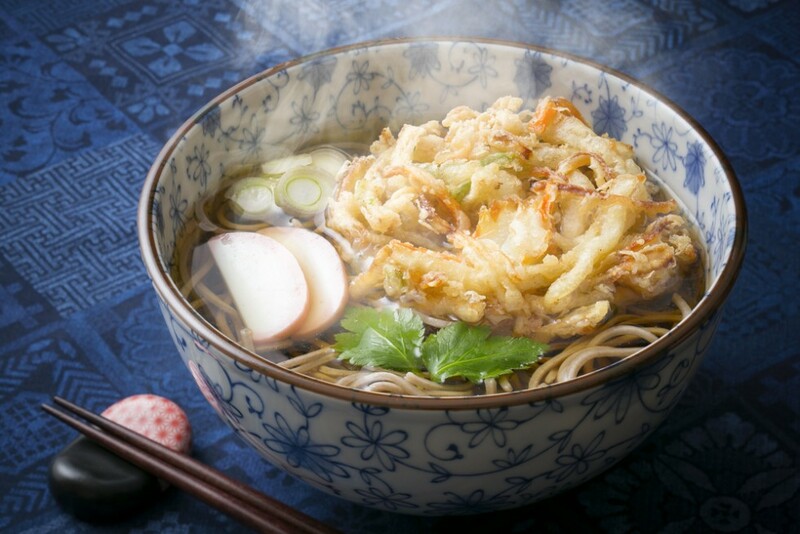 People eat Soba on December 31, either for dinner or as a late-night snack, to wish for a life that’s as long as the long, skinny noodles you’re eating. Eating Osechi. 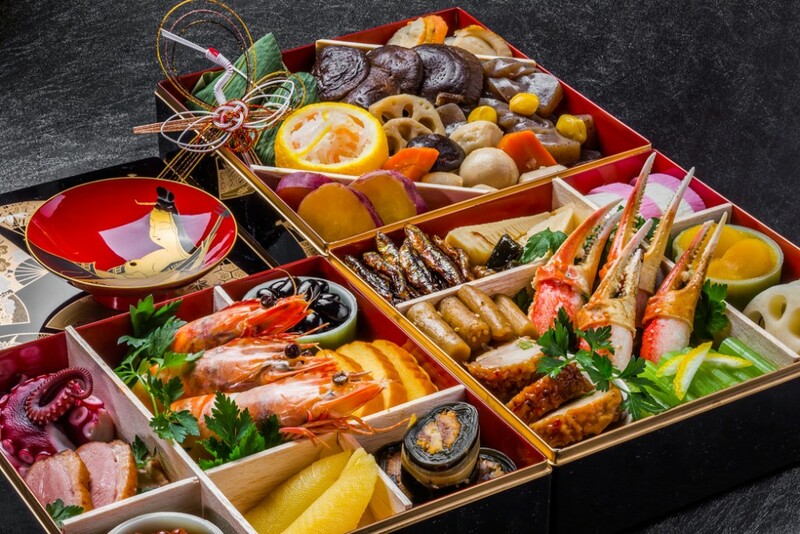 These are traditional New Year foods, which are usually served in special boxes, kind of resembling a more elegant form of the popular bento boxes. Each dish in Osechi has a special meaning for the new year. Ringing of Temple bells. The bells at most Temples in Japan are rung 108 times as the old year fades out and the new year comes in. This is done to give up the 108 human desires that lead to disharmony. In Japan, sunrise on New Year’s Day is believed to have special supernatural powers, and praying to the first sunrise of the year has become a popular practice since the Meiji era (1868–1912). All over Japan, Crowds gather on mountaintops, beaches, or rooftops with good views of the sunrise to pray for health, family, and success in the new year. Another observed custom is visiting a temple or shrine at New Year’s, which is known as Hatsumode (初詣). As you can probably imagine, due to this custom, the crowds in the first few days of the new year are absolutely huge (even by Japanese standards) at temples and shrines. Boasting an impressive 9 Million visitors per year, this traditional Shinto Shrine sits in the heart of Nagoya, and has been a centre of worship for around 1900 years. Thought to hold the legendary sword kusanagi no tsurugi (草薙劍), which is one of the three most treasured symbols in Japan, this Shrine is 2nd in popularity only to Ise Jingu in nearby Mie Prefecture. This hugely popular shrine has 2,000 years of history behind it, and is one of the most important places of worship in Japan. Often said to be the holiest Shinto Shrine in the world due to the belief that the spirits of the Imperial Family’s ancestors are enshrined therein, the recently remodelled Ise Jingu boasts some of the highest visitor numbers in all of Japan. As you can imagine, for Hatsumode, it can get rather crowded, but is definitely worth a visit. Moving from Central Japan, all the way down to Fukuoka in Northern Kyushu, this popular shrine is known throughout Japan for its natural beauty, including 6,000 Plum Blossom trees inside the temple grounds. Probably the most famous tree in all of Japan is located right next to the main shrine, and according to legend, when Sugawara no Michizane, an important scholar, poet, and politician, left Kyoto in exile, he yearned so much for this tree that it uprooted itself and flew to this Temple. Heading to Osaka, we find this popular attraction. Housing the Sumiyoshi Okami, or “Great Gods of Sumiyoshi”, this historic shrine is a top Hatsumode spot and attracted 2.5 Million visitors on January 3rd, 2015 alone. One of the features of this shrine is the road leading up to it, which has market stalls to the left and right sides of the street, thus creating a lively atmosphere for visitors and worshippers alike. Arguably THE most recognisable Shrine in Japan due to the “Senbontori” or 1,000 red Tori (gates) leading up to it, this Kyoto landmark has attracted visitors since time immemorial and has been referenced more than any other Shrine in modern pop culture, from Memoirs of a Geisha, to Kamen Rider. For many people, this is part of the quintessential Japan experience, and the view of the shrine and its famous gates, is definitely worth the hike. While there are numerous places to choose from in Tokyo, this rather small and simple Shrine is extremely popular due to its close proximity to Ginza and Nihonbashi, and for the fact that its a shrine for pregnancy and child-rearing. Many people come here during the New Year period to pray particularly for that reason – to get good luck either conceiving a child, or for help with rearing a child in the new year. The only Shrine on this list with Ocean Views, Isuzan is Shizouka’s premier place of worship, and a tourist favourite in Japan’s “Green Tea” Prefecture. Known as the “Temple of Marriage”, this Shrine is quite popular with young and old alike, as it is supposed to bring marital harmony to all worshippers who make the pilgrimage here. Not including this incredibly recognisable and insanely popular Temple would be a crime, so I’ve added it as a Bonus here. Located in Asakusa, and also known to many as Asakusa Kannon Temple, this colourful and popular place is an instantly recognisable Tokyo landmark that’s included in any tourist’s itinerary. 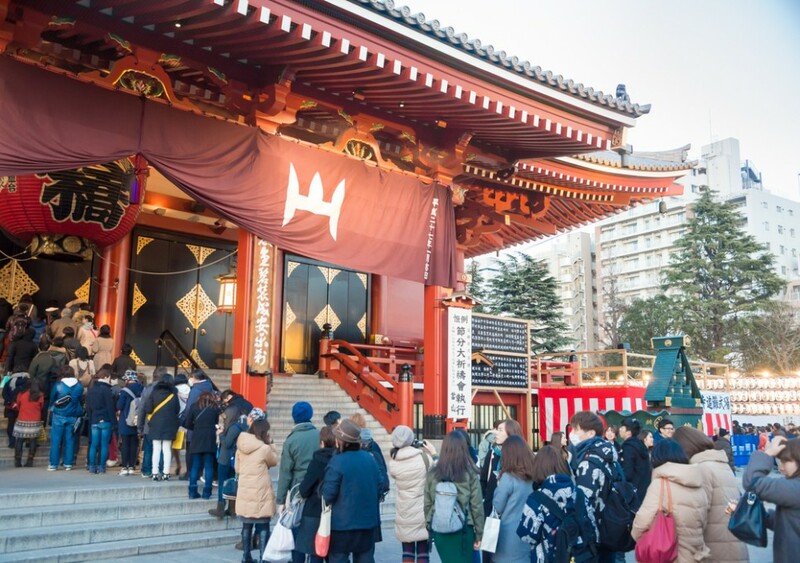 As Tokyo’s oldest Temple, it is already quite popular, but visitor numbers for New Years here can reach insane numbers. If you’re brave enough to visit during the new year period, be prepared for hours of waiting to reach the main prayer hall. With the long market street leading up to it, it is always worth a visit, however, and should not be missing from any trip to Tokyo. 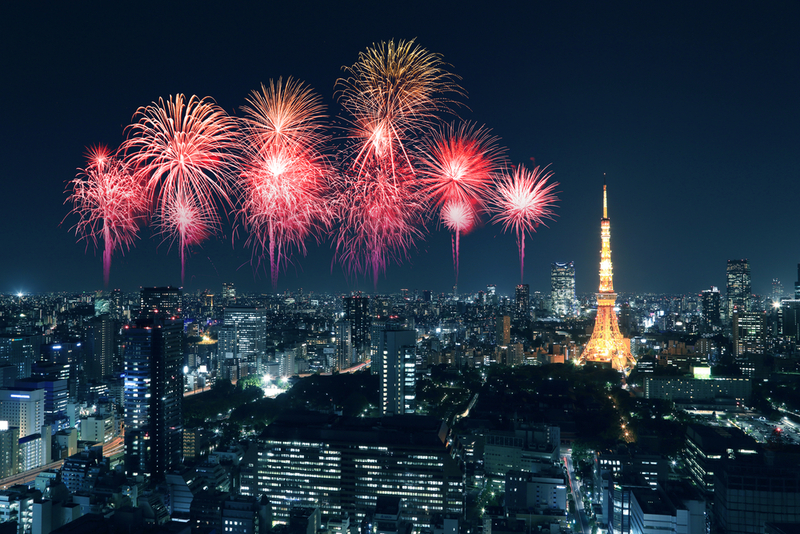 That’s it folks, the top 7, ermm, top 8 places to visit for ringing in the New Year in Japan. Whether you’re on vacation, or a resident in Japan, a visit to a Shrine or Temple is a must during this time of year. If you’re a religious, or spiritual person, a believer, or cultural connoisseur, from behind my computer screen, I wish you all the best for the Year of the Monkey…. in 2016. Previous articleDeck The Halls with…lots of Kentucky Fried Chicken?? ?